BELIZE CITY, Mon. Feb. 16, 2015–In the last municipal elections held in 2012, there were 170 candidates; for the upcoming municipals, to be held on March 4, 2015, there are a total of 163 candidates: 26 mayoral candidates (down from 28 in 2012) and 137 councilor candidates (down from 142). The race will be strictly between the two dominant parties – the ruling United Democratic Party (UDP) and the Opposition People’s United Party (PUP) – in the northernmost municipalities of Corozal and Orange Walk as well as in the twin towns of San Ignacio and Santa Elena; however, third parties and independent candidates have thrown their hats into the electoral ring for the remaining 6 municipalities. 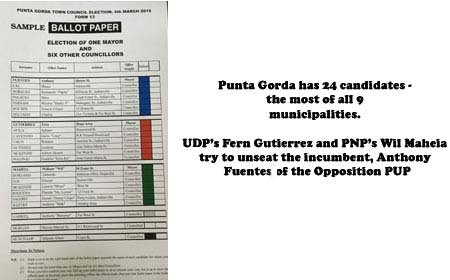 Punta Gorda is the municipality with the most candidates (24). In that town, the People’s National Party (PNP) has nominated a full slate led by PNP leader Wil Maheia, and there are three independent councilor candidates who will compete alongside the mass parties. PG mayor Anthony Fuentes, the incumbent PUP candidate, is making a bid to retain his seat, but he is being challenged by Fern Gutierrez, the female councilor who landed the only seat on that council for the UDP in 2012, after having garnered the most votes for her slate. Belmopan candidates will have the most mayoral candidates to choose from, with Hubert Enriquez of Vision Inspired by the People (VIP) and independent mayoral candidates: Richard Smith and Wilfredo Guerrero, challenging the UDP’s Khalid Belisle and the PUP’s Jose Chacon. There are a total of 23 candidates for that municipality. Since Belize City has the most available seats, it will also see a total of 24 candidates for City residents to choose from: 1 mayoral candidate and 11 councilor candidates for the UDP and PUP respectively. The 2012 elections saw 32 candidates in the City, with the VIP nominating a partial slate. However, this year, no third party has nominated candidates in the City. Ernesto Torres, who has competed independently before with extremely low voter support, is not giving up and he is still making another bid for the post of mayor. In San Pedro, the VIP’s Bobby Lopez is back in the race and he wants to challenge incumbent mayor, the UDP’s Danny Guerrero, for that seat. The Opposition PUP is also contending for that seat with a full slate led by Dr. Giovanni Solorzano. Dangriga and Benque Viejo del Carmen have full slates of UDP and PUP contenders, and in each municipality, an independent mayoral candidate has been nominated to join in the race. Neither independent candidates are dissuaded by the fact that when they ran in the previous elections, they, like Torres in Belize City, received less than 1% of the votes. Christopher Lewis received 30 votes of 2523 votes cast when he ran as mayoral candidate back in 2009, and Domingo Obando received 12 votes of the 3225 votes cast when he ran in 2012. Candidates were formally nominated on Wednesday, February 11, 2015, and sample ballots have already been produced with their names.